These are among the cuts to services and jobs that have been announced so far by councils across Britain. Many have yet to formally announce their plans, including councils in Greater London and the North East. The government says it has taken "a progressive, fair approach" when calculating the funding for local government grants and that "more money is being channelled at those areas of the country that have the highest levels of need". Ministers argue that reductions to council spending "reflect the urgent need for the public sector to help put the country's finances back in order, keep interest rates down and prevent national debt escalating to £1.4 trillion of taxpayers' money." It claims the settlement represents a fair deal that will "enable councils to protect the front-line services people rely on, shield the most vulnerable places, safeguard the most vulnerable people and protect taxpayers' interests." Manchester City Council has announced £110m in savings in the next financial year. Leisure centres, libraries and public toilets will close, and 2,000 jobs will be lost (17% of its workforce). It said 41% of job losses would be among managers. Children's services will be cut by 26% or £45.1m. However, social workers for vulnerable children will be increased. Liverpool City Council says it will shed 1,500 jobs by the end of March 2013. Council leaders said they had to find £141m of savings between now and 2013 - £91m of them in 2011/12. The council, which has 9,000 employees, said it could not yet confirm the areas affected. Some 3,000 jobs will be cut under plans unveiled by Leeds City Council to tackle a £90m funding black hole. Adult social care facilities will be hit by the cuts with 13 buildings currently used for day care and support facing closure. Labour-controlled Kirklees council is based in Huddersfield, but also covers the towns of Dewsbury, Batley and Holmfirth. Adult social care is being scaled back there as the council makes millions of pounds of savings following government funding cuts. Kirklees Council said the new approach would result in £2m savings a year, contributing to the £80m savings the council has to make by 2014. Sheffield City Council has announced 270 jobs will be axed over the next financial year as the local authority looks to save £80m. More than 400 posts have already been cut this year as a result of voluntary redundancies or unfilled vacancies. North Yorkshire County Council has announced it will cut 330 jobs and close nine care homes for elderly people to save £69m over the next four years. At the City of York Council, officials are planning to make £21m of savings within 12 months. Lincolnshire County Council wants to cut 818 staff by the summer as part of its plans to save £125m from its budget in the next four years. Consultation with 3,200 staff members over the proposals has already begun. A total of 522 of the jobs would be in children's services and adult and children's social care. Lincoln City Council is preparing to cut £1.5m a year from its annual budget until 2012, council officials say. The cuts are needed to balance the books and will mean a review of services. Council spokesman Simon Walters said it would review all 400 different services to decide where money could be saved and which services could be cut. Derby City Council is proposing to cut almost £5m from its health and housing budget in a bid to save £27m over the next two years. The Conservative-led council will also freeze council staff salaries and council tax for the next two years. The cuts could result in 570 job losses, but that figure was only an estimate, the council said. Birmingham City Council says that 7,000 jobs must go in a bid to save £300m. So far 1,500 staff have requested voluntary redundancy, meaning forced losses will be "significantly reduced," council officials have said. Some £212m - 71% of the savings target - will be made in the 12 months from April this year. Before Christmas, Christmas Coventry City Council approved plans to save £146m by 2014, which may result in up to 1,000 jobs being lost. East Sussex County Council has announced £37m in cuts next year. Spending on children's services will be reduced by £20m, which the council blames on cuts in government grants and increases in child protection services. It estimates 150 to 200 full-time equivalent jobs will go next year but unions say up to 400 people, including part-timers, will be affected. Medway Council is to cut 157 jobs as it makes savings of £23m. The council's funding from the government is being cut by more than 11%. However, council tax will be frozen and the authority said increases in fees and charges for services for the vulnerable would be kept to a minimum. The council employs more than 3,000 people and 130 of the job losses were announced last year. It said front-line services would be unaffected by the cuts, and it had gone through each department to identify many smaller savings, rather than looking at closures of major services. Bristol City Council will cut 340 jobs during the next financial year, it has announced. The authority said 160 of the job losses would be made up through either voluntary or compulsory redundancies. Another 180 of those would come through "managing vacancies, redeployment and natural wastage". In December, Cornwall County Council approved budget cuts of £170m over four years, including a 23% reduction in its library budget. Councils across Scotland have been setting out their spending plans for the coming year. Scotland's largest authority, Glasgow City Council, approved a savings package of nearly £60m in the next financial year in an effort to address a shortfall in funding. It set its budget for 2011/12 at just over £1.3bn to match a reduction of 3.6% in funding from the Scottish government. Steps include cutting £400,000 of funding for VisitScotland and saving £1m through refuse collection changes. But it will also treble its planned roads maintenance budget to £12m to deal with potholes caused by harsh weather late last year. Edinburgh City Council, which faces making more than £90m in savings over three years, set its revenue budget at just over £1bn for 2011/12. It expects to save £51m in efficiency measures, including streamlining and reducing layers of management and improving procurement of goods and services. First Minister Carwyn Jones says the cost of spending cuts on Wales could be felt for generations. 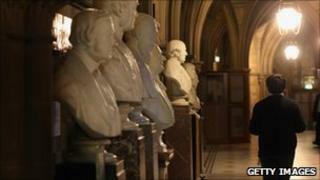 He said Wales was facing its toughest challenge since devolution with a "devastating impact". As he spoke, a new poll suggested 57% in Wales believe public sector cuts were being implemented unfairly. Torfaen Council plans to axe 80 jobs and save £9.2m. The council said it needed to save £9.2m to balance the books. Other Welsh councils which have announced cuts include Cardiff, which is envisaging cuts totalling £90m and 250 jobs over three years. Rhondda Cynon Taf will save £20m a year over three years, Flintshire will cut spending by £12m next year and Wrexham will lose £8.1m from its budget in the next 12 months. The Northern Ireland executive has extended the consultation period on its draft budget by a week. It aims to save £4bn over the next four years, with cuts planned across all departments. The deadline for submissions will now be 16 February because so many departments were late publishing their spending plans. All government departments are expected to see falling revenue with the exception of the core health service budget, which will see a marginal increase in real terms.